Right now at the Starbucks Reserve Roastery and Tasting Room, there are three Rwandan Cup of Excellence Coffees. 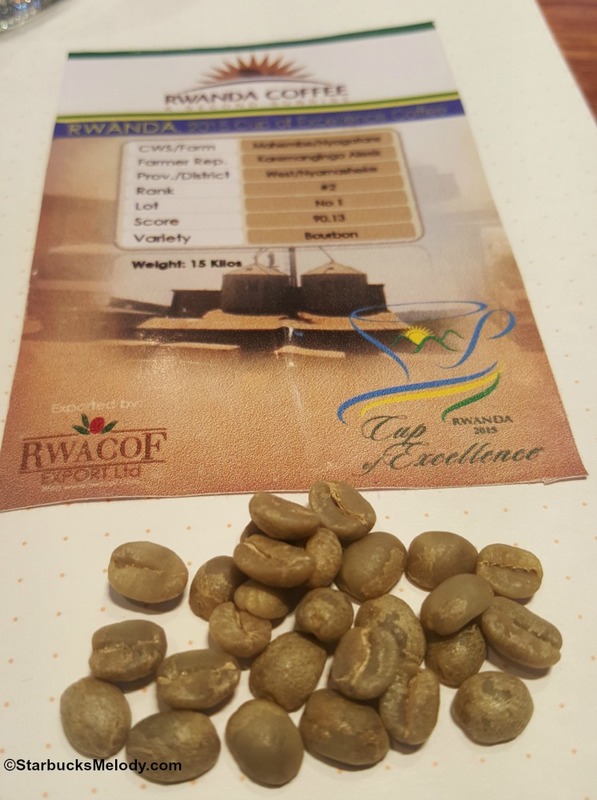 I'll spend the most time discussing the Rwanda Mahembe, which scored a very high 90.13 in the 2015 Rwandan Cup of Excellence competition. A Cup of Excellence rating on a coffee is indeed an indication of an extremely exquisite, high quality, unique, and delicious coffee. 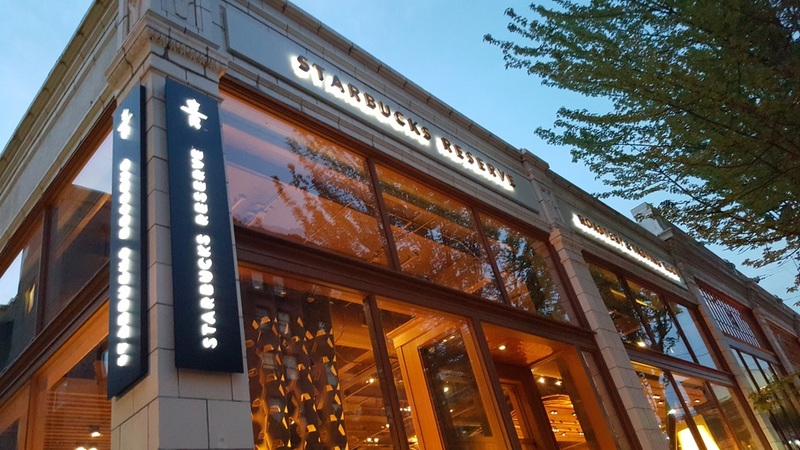 This is only the second time that Starbucks has offered a Cup of Excellence coffee. The first was about one year ago, when Starbucks offered the Brazil Sitio Baixadao coffee. 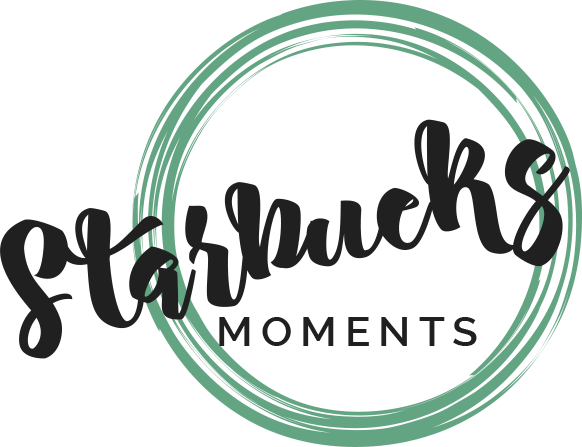 According to Starbucks, there were 284 competition entries into the 2015 Rwandan Cup of Excellence competition. This article here also mentions over 280 coffee entries in this competition. Out of 280 coffee entries, only 24 ended being ranked: That is, 24 of the 280 coffee received a score of 85 (out of 100 possible) or higher. From the Cup of Excellence website, we learn a lot of detail about the final 24 coffees, given a Cup of Excellence ranking and designation. Starbucks purchased three of the top 24 coffees. The Rwanda Mahembe is offered in Starbucks Flavorlock packaging as well as freshly scooped from the Roastery scoop bar. The card that comes with it is brightly colored with yellows, pinks and oranges. All three of the above coffees are fully washed, and all three are the Bourbon coffee varietal. Each have very unique flavors, demonstrating how farming, processing, and micro climates create unique coffee flavors. According to the Cup of Excellence website, there were 31 bags of this (under the "lot" category). 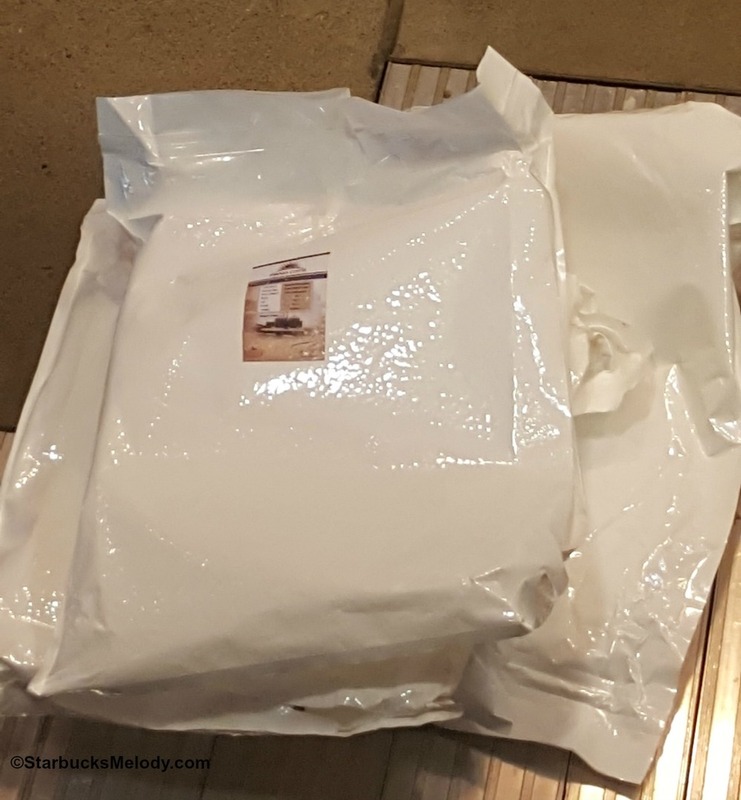 A bag of green coffee can be anywhere from 50 to 70 pounds, based upon an educated guess (and having seen the bags it came in). 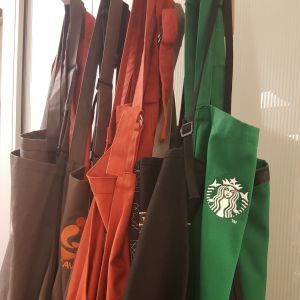 If each bag is 60 pounds, then perhaps Starbucks sourced about 1800 (maybe 2000) pounds of green coffee. A coffee loses weight during the roasting process because of the loss of moisture, thus roasted yield of that will be slightly less than the green coffee yield. If, just as a guess, this coffee loss 15% of its weight during roasting, Starbucks would end up with roughly 1,500 pounds of roasted coffee. 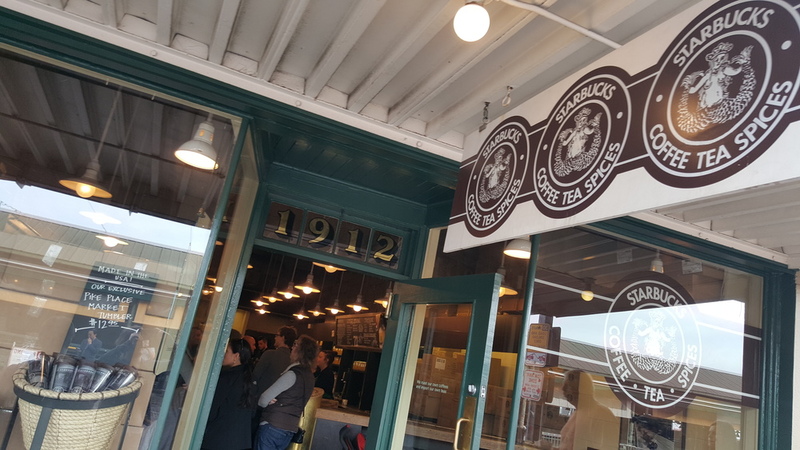 Starbucks sells coffee in 8.8 ounce Flavorlock bags or at the scoop bar at the Roastery, often sold in 8 ounce increments. So my wild guess would be that Starbucks will sell very roughly 3000 half-pound bags of this coffee. Please, please, note, this is all my guesswork. If I find out an official number of how many pounds of Rwanda Mahembe coffee that Starbucks purchased at auction (the auction was September 2015), I'll let you know. The tasting description for the Rwanda Mahembe includes orange, peach, honey, and chocolate. You can buy all 3 of these Rwandan coffees (while supplies last) by the cup at the "Experience Bar" area of the Roastery. I tried it tonight from the Clover and LOVED it. If somehow you have the chance to have this brewed on the Clover, I recommend it. It's a medium bodied coffee, with high acidity. The roast profile is light to perhaps the very light edge of medium. I got tons of orange and peach flavor notes! It's a naturally sweet coffee, that develops a creamier flavor note as it cools off (at least that's what I observed with a guided tasting from Roastery partners). One Roastery partner felt that as it cools, it develops a little savory component, like a tomato-basil soup. This is a must-try coffee. Don't add sugar or milk! Just enjoy this unique coffee black! I happened to drop by the Roastery on March 5th, when the coffee roasters at the Roastery were roasting a batch of this. The packaging for this coffee is extremely unique! It comes in white plastic bags with a sticker showing its Cup of Excellence designation. Since I was there when a batch of it was being roasted, I got the chance to see a few of the unroasted beans too! There is gossip that this coffee may show up on StarbucksStore.com at some point also. 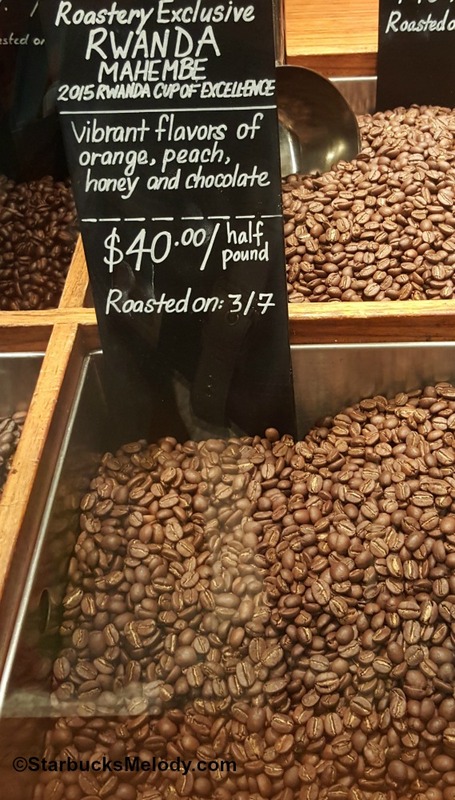 The Rwanda Mahembe retails for $40 per half pound. Unfortunately, I haven't tried this coffee yet, and don't have a lot of information on it yet. Like the other two Rwanda Cup of Excellence coffees, it's a Bourbon varietal, wash-processed, and was bought at auction in September last year. One interesting thing about Rwandan coffee is often the washing station is shared by many farmers. Again, all three of this coffees can be purchasedby the cup at the Starbucks Experience Bar at the Roastery. It's a light roast coffee also. The scoop bar sign description for this coffee is lemon citrus and toffee nut. 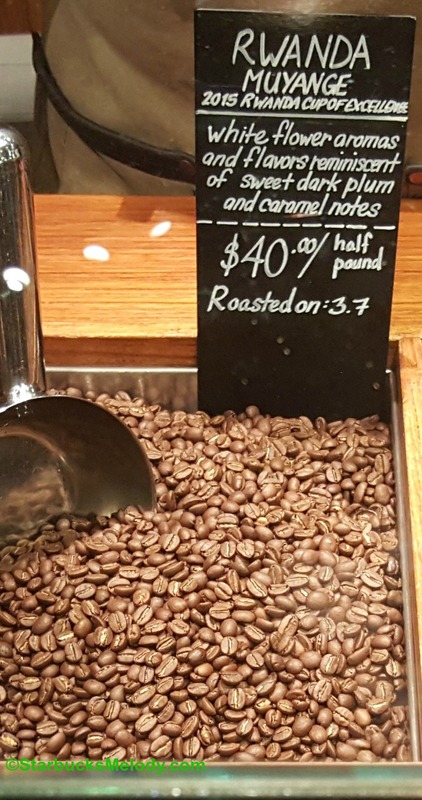 This coffee is also $40 per half pound. This was the 9th ranking Rwanda Cup of Excellence coffee. I discovered that this is a partner favorite for a number of Roastery partners. The tasting notes are floral, plum, and caramel. I tried this one today at the Experience Bar and loved it. I got lots of plum flavors and a hint of white flower, like a blossom. I tried it made by the Clover, and one of the partners mentioned that more of the floral notes of the coffee come out when it's made by a pour over brew method. The aroma was almost slightly nutty to me. I hope you get the chance to try this one too! 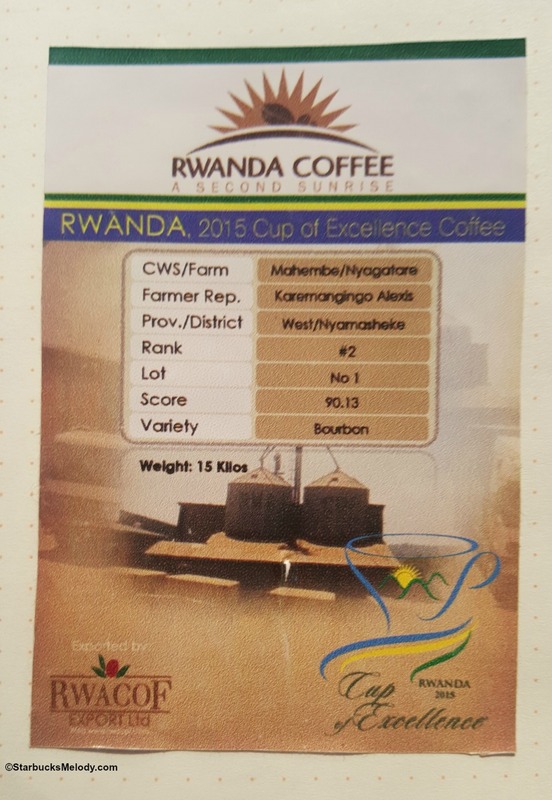 Neither the Rwanda Muyange nor the Rwanda Maraba have the pretty printed tasting cards to go with them. (I really wish they did! I'd buy more of it for the cards too ;)). 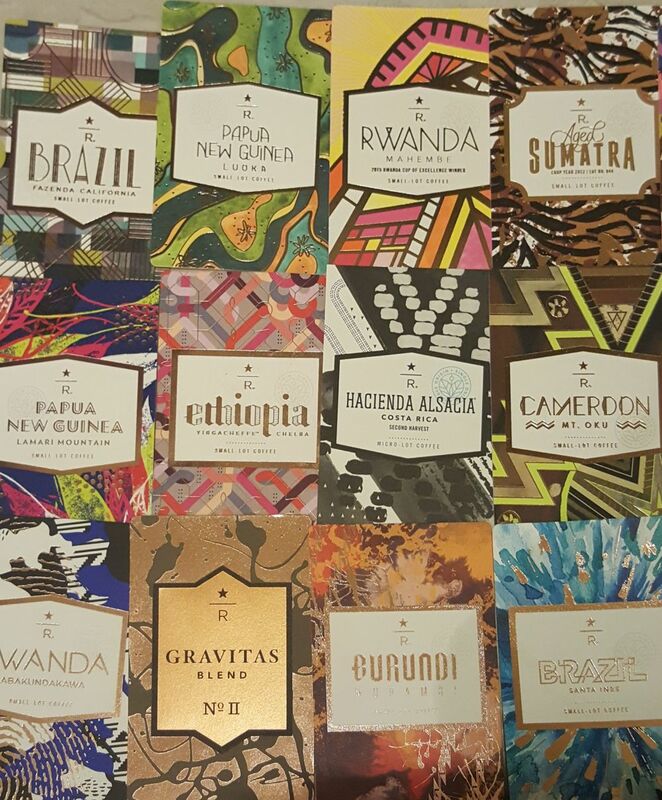 I hope you get the chance to try at least one of these magnificent coffees! Getting to try a Cup of Excellence coffee, is great for your coffee education!